One of the Durban International Convention Centre’s (Durban ICC) biggest triumph is being a catalyst for economic growth, having contributed more than R40 billion to the South African economy since opening its doors 21 years ago. The majority of the Centre’s economic contribution has benefitted the people of Durban and KwaZulu-Natal. Opened by the first democratic President of South Africa Nelson Mandela in 1997, the Durban ICC continues to transform people’s lives and has prioritised entrepreneurship and the advancement of Small, Medium and Micro-sized Enterprises as a stimulus to achieving economic growth and development. The Centre has been a trailblazer and Africa’s leading Convention Centre for over two decades. This indeed, is a reputation the Durban ICC works hard to maintain through the commitment of its employees and support from stakeholders. Furthermore, by attracting a number of premier and world-class international events to our shores, the Durban ICC is a veritable engine room for the creation of jobs and has been responsible for creating and sustaining more than 100 000 jobs cumulatively over the past 11 years. The Durban ICC story is one of foresight, vision, co-operation, determination, patience and ultimately outstanding success. Businessman and diplomat Andrzej Kiepiela, who was also a member of the original project implementation team for the Durban ICC, said the bold and critical announcement to build the country’s first ever international convention centre was made in 1993 despite strong opposition. At the time the Durban ICC was one of the single largest investments made by the City of Durban. The project was the brain child of Operation Jumpstart, which was created to kick-start development in Durban and KwaZulu-Natal. It recommended as part of its list of catalytic projects, the construction of an international convention centre in Durban, he said. Kiepiela said the Durban ICC project implementation team travelled to 26 countries across Europe, United States of America, East Asia and Australia to name a few as part of their benchmarking exercise. “We came up with a concept as a team to build a facility that is versatile and one that would contribute to the growth of the convention and meetings industry in the country. After many months of discussions, the Durban City Council approved the proposal to build the centre and the first phase of the development of the Durban International Convention Centre commenced,” he said. Kiepiela said some of the reasons behind such fierce opposition against the construction of the Durban ICC was purely the “fear of the unknown” and “competing forces politically as others felt the money could be better used for housing development”. He said the concept to build a convention centre came at a time when South Africa was very isolated from the rest of the world because of its oppressive apartheid laws. “The feeling was that no conventions would come to South Africa outside our borders because of the political instability in the country before the 1994 democratic elections. But after the 1994 elections the number of international airlines flying into South Africa grew. Democracy opened up a lot of doors for the country. If it wasn’t for the construction of the Durban ICC, there would be no growth in the tourism industry. The Durban ICC forms an integral part of business tourism and we need to develop more major annual arts and cultural events in Durban,” he said. Jonathan Edkins, Chief Executive Officer of Vusa Collaborative, was part of the Durban ICC’s architectural design team, said the design and development of the facility was driven by professionally qualified city officials, in symbiotic partnership with experienced private sector specialists, working together in a highly motivated and enthusiastic team. “In this pioneering building, architectural form followed function to the extent that the elements were primarily conceived as fabric skins around a business, its operations, and processes. 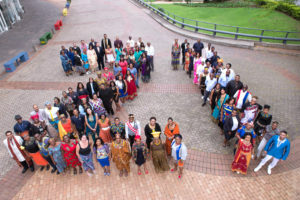 Supporting this approach was the fact that the business developer, ICC Durban (Pty) Ltd, was simultaneously working with local businesses and industry, to design, document and implement the operational business aspects for the new convention industry in Durban, and across South Africa,” he said. Edkins said the Durban ICC as it stands now, is the product of three development phases. The first phase, constructed from 1994 to 1997, established the convention industry in South Africa, and provided a versatile, flexible venue for up to 5 000 delegates. An extension at the south end of the Centre was constructed in 2002, combined with expansion of the basement parking, to accommodate 1200 cars. This was followed by the development of the Durban ICC Arena, between 2003 and 2007, which more than doubled the flat-floor capacity, introduced new market opportunities, and enabled the Centre to remain ahead of its competitors. “The design concept for the Durban ICC is all about flexibility and multiple use, ease of service and strict transformation timeframes for back-to-back events. Massive operable walls, direct servicing and access plans, clear and obvious movement routes and high-end new electronic building management technology were deployed to ensure that the building was efficient and “cutting-edge” in terms of its operation and service from day one. The raked seating at the Plenary Hall which can be raised into the ceiling to create a flat-floor venue, was a unique concept at the time. This versatility has enabled spaces at Durban ICC to be converted rapidly for different uses and different customers,” added Edkins. Edkins added that very significant economic and social benefits can be stimulated through further upgrades and development of the Durban ICC. This includes increased revenue-generating opportunities, through the provision of a range of additional infrastructure, established in the vicinity and environs of the Centre, which will increase local and tourist activity. Sadha Naidoo Durban ICC Board member and Chief Executive Officer of Calypso Group said over the last 21 years, the Durban ICC has contributed significantly in stimulating the economy, promoting local development and acting as a stimulus for tourism growth. The Independent Economic Impact Study indicates that over the last 12 years, the Durban ICC has contributed more than R406 billion to the national economy. Integral in this contribution would be the job creation and economic stimulus that the Durban ICC has provided, he said. “While the Durban ICC has been a trailblazer and Africa’s leading Convention Centre in the last 21 years, the business tourism sector now presents itself with greater competition and opportunities. Business tourism centres have not only emerged in South Africa but also from the ruins of war and destruction in countries like Rwanda. In order to ensure sustainability and growth, the Durban ICC together with the City and Province need to remain innovative and strategic in its business operations. This should include a more competitive approach in growing the Corporate, Government and Association segments of the revenue streams,” he said. Naidoo concluded that international trends point towards an integrated and innovative approach to ensure that business tourism provides benefits and opportunities throughout the value chain. This includes focusing on “bleisure” and ensuring that for example pre and post tours are geographically distributed in the Province and Country. He also said the Durban ICC is strategically positioned to elevate the knowledge, cultural, entertainment and cuisine strengths of the City and Province. “The growth and success of the Durban ICC over the last 21 years is a tribute to the numerous visionaries and leaders who have driven and led the organisation to its present heights. It is on this bedrock that we are in a position to build on a successful future for all stakeholders in our City, Province and Country,” he said. Former Durban ICC Board Chairman Paulos Ngcobo, who was involved with the Durban ICC since its inception said the socio-economic impact created by the existence of the Centre has significantly benefited the events and tourism sector, not only in Durban but South Africa as a whole. “The Durban ICC has firmly established Durban and KwaZulu-Natal on the global conferencing map. The Centre has been the pioneer for the growth of the conferencing, meetings and exhibitions industry in South Africa with the other major cities in South Africa following Durban’s example in constructing convention centres of their own,” he said. Ngcobo also called on stakeholders to do more to transform the tourism sector in order to empower previously disadvantaged communities.